Breath of God Lutheran Church in the Highland neighborhood of Baltimore, Md., meets on the 3rd Sunday of Advent. Editor’s note: This is the third post in a four-part series on objects from church that shed light on the spiritual practice of waiting this Advent. For many, the pews are the spaces at church where we wait the most. We come to the pews like Doris and Vera, widows and best friends, who gather together for support and love. We come like Bill and Alma, who wait to greet their adopted grandchildren and bond with them during worship. We come like Connie, who waits for peace after the unexpected death of her husband. We come to grieve. We come to share joy. We come to experience a God who meets us in the most humble and simple origins—a tiny baby in a manger bed. We come to sit in the pews and be known. Through the seasons of our lives and the seasons of the church year, the pews remain strong. In each pew, expectations, dreams, doubts and hopes are held. Memories and emotions and stories are wrapped and bound into their wood. The grains and crevices give way to decades of life experienced together as a community. And now in the midst of Advent, with hearts full of hope and expectation, the pews give us places to wait in our restlessness. These church pews remind us of what we’re waiting for and that our waiting is never wasted. Perhaps it’s the lighting of the Advent wreath or the dark notes of Advent hymns or the ringing of church bells or the deep blues and purples that surround our worship spaces that help us to know that Christ’s light shines for us. 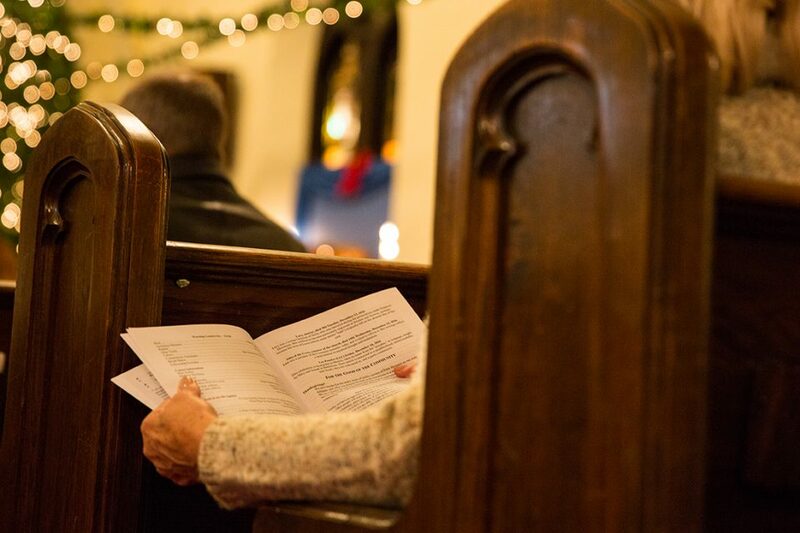 Or perhaps it’s the simple act of sitting in the pews week after week—especially during the Advent season—in which we become aware of God’s presence with us, in the flesh. For it is in this season of Advent waiting that we can trust that God does come to us. That God’s presence joins us in the pews. That God makes room for us. That God knows our stories and holds them too. That God sits with us in the pain and brokenness and doubt and frustration. That God rejoices in our lives. That the birth of the baby born in the manger is for us. That Immanuel (God-with-us) really does mean that we are never alone. The pews of our churches teach us the power of presence and support. Of simply sitting. Of showing up for someone with a hand to hold. Of waiting. Of being present together in the body of Christ. Welcome! I’m glad you’re here; come and sit. I’ve been waiting for you.